NTFC Supporters’ Trust chairman Andy Roberts has urged fans of the club ‘to keep an open mind’ ahead of Sunday’s public meeting, which is being held to discuss the potential future community ownership of the Cobblers. The ‘Project: Proud To Be’ meeting is being held at the Park Inn by Radisson hotel in Northampton town centre this Sunday (March 10), starting at 1pm. The meeting is open to all, and among the topics under discussion will be a ‘community ownership model’ for the Cobblers. The guest speakers will be Nick Hawker, the chairman of Exeter City Supporters Trust, Ashley Brown of Supporters Direct, who specialises in the field of community ownership in football, and former Wycombe Wanderers chairman Don Woodward. There will then be a Q&A session at the end for supporters to air their views. The Cobblers are currently under the ownership of chairman Kelvin Thomas and his fellow directors, David Bower and Mike Wailing. Things have picked up on the pitch of late, with Town on a five-match unbeaten run, and as respectful Roberts and the Trust are of the work being done by the current owners, they are keen to look at the long-term options for the club. And they want the club’s supporters to go along to the meeting and be open to new ideas. 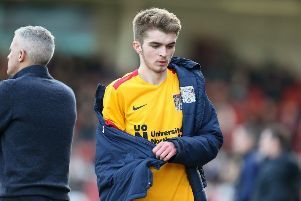 “We are looking in future at a possible different way of doing things, or constructing things for the football club,” said Roberts, speaking in an interview with Neil Egerton on the It’s All Cobblers To Me podcast. “It is not a slight on Kelvin Thomas or David Bower and some of the things they have done at the club, certainly on the commercial side and on the community side, because there is a lot of good stuff going on. “It is quite challenging, it is a big ask really, but what I would ask people is that if you have got concerns and you are not convinced, please still come along to the public meeting, don’t close your mind to it and just listen to what we have to say. “You might come out of it and think ‘no, it’s still not for me’, and that is fair enough. “But please come along and see what other people have to say, see what other ideas are there, see what might be a realistic achievement. “It is a great opportunity to look at a different way of doing things. And he added: “This might not happen, we are just exploring it at the moment, but please keep an open mind. “There are frictions between the Trust and club, and the Trust and certain other fan groups and indivduals, and a whole lot of things come into play. “I know the Trust isn’t everyone’s cup of tea and we accept we perhaps haven’t communicated with the Trust members or the fanbase as well as we could have done in previous years, but we are working hard to sort that out. “All I can assure fans who aren’t members of the Trust or have suspicions about the organisation, we are all Cobblers fans at heart. “We want to be critical friends of the club. We love the club and want it to do well, as we all do, but we need to have an eye on the future. “If you have supported the club for the length of time I have, then you know things are probably going to go pear shaped before too long, and we need to have a bit of a plan to deal with that eventuality. “We know it is a Sunday afternoon, we know people’s time is precious, but please come and have a listen to the discussion. You never know, your mind might be changed. “One thing I would stress is that I would say the time is right for us to have a proper look at a different way forward for the football club.